Jose Mourinho Slams Arsene Wenger Again! The Portuguese coach could not resist aiming a dig at his rival after admitting that Manchester United’s draw with Arsenal felt like a defeat. Olivier Giroud popped up in the 89th minute to salvage a point on an otherwise disappointing day for the Gunners. Juan Mata’s goal looked to have secured United a deserved victory, but they slumped to a third Premier League draw at home in a row and remain six points behind Arsenal. 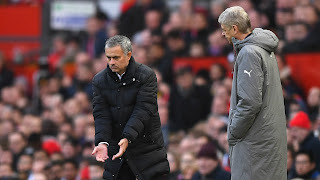 Mourinho has never lost to Wenger in the Premier League – a run that stretched to 12 meetings on Saturday – but the Portuguese could not resist a dig at his great rival after admitting that United’s failure to see the game out left them feeling like they had lost. “It feels like a defeat and, for sure, for Arsenal it feels like a victory,” Mourinho told reporters. “Of course it is two points dropped,” he added, speaking to the BBC. “It was another defeat. “They had no chances to win. They could not be Arsenal the way they normally play football. We were phenomenal defensively, the way we pressed and the way we controlled their counter attacks. Then when we had the ball we were very comfortable. “If you have a bad game, or an equal game against a very good team like Arsenal, you draw and it is not a drama or a bad result because it is normal between two teams. The draw means United could be as many as nine points behind Chelsea at the top of the Premier League table if the Blues beat Middlesbrough Today.